Defined as bubbles of gas in liquid-film matrix, foams are important precursors in the food and cosmetic industry and for the production of macroporous materials. In this report a simple, effective route to silica nanoparticle stabilised responsive aqueous foams has been demonstrated by the Binks group. Stimuli-responsive surface active particles have generated growing interest in recent years, utilising triggers including pH, temperature and light irradiation to create ‘switchable’ foams, i.e. the ability to “switch-off” the foaming capability of the particles. However, the production of responsive surface active particles usually involves surface coating of mineral particles or the complicated synthesis of functional polymer particles. In order to address this problem Binks et al. utilise the interaction of N’-dodecyl-N,N-dimethylacetamidinium bicarbonate, a responsive surfactant, with anionic silica nanoparticles in water. By exposure to either CO2 or N2 the responsive surfactant can be switched between a cationic species and a surface-inactive neural form, respectively. On the formation of the cationic species, complexation of the surfactant to anionic silica nanoparticle surfaces gives an in situ increase in the hydrophobicity of the silica, yielding surface-active nanoparticles. Agitation of the resulting complexed system gives foams, however, on exposure to N2 the responsive surfactant returns to its neutral state and desorbs from the surface of the silica particles, resulting in desorption of the particles from the water-air interface. This simple route to switchable particle-stabilized aqueous foams removes the need for the complicated synthesis of particles as ‘bare’ silica nanoparticles can be used. The synergistic effect of the responsive surfactant and the nanoparticles also allows for the production of foams using a much lower concentration of surfactant than in a responsive-surfactant system alone. 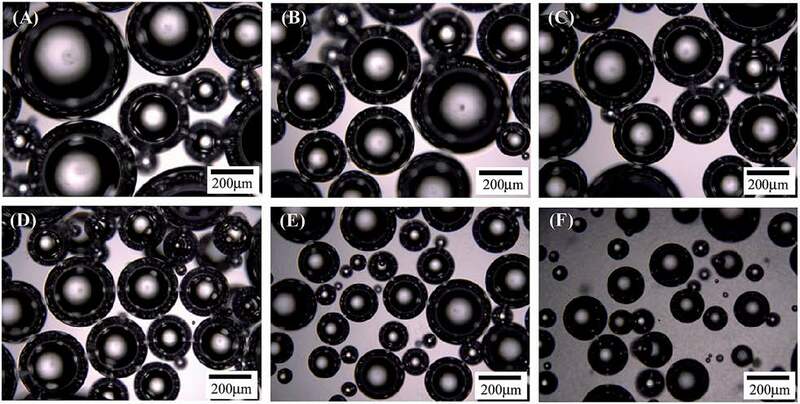 Micrographs of the bubbles in foams produced by shaking 10 cm3 of a dispersion of 0.5 wt% particles in a surfactant solution at different concentrations in bottles (25 cm3) taken immediately after shaking. Surfactant concentrations from A to F are: 0.1, 0.2, 0.3, 0.6, 1.0 and 2.0 mM. This post was written by web writer Rob Woodward. Rob is currently based in Imperial College London working in the Polymer and Composite Engineering (PaCE) group. Rob has a background in both responsive polymeric surfactants and microporous organic polymers for carbon capture and storage.